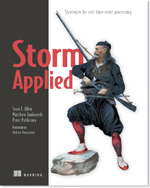 At the May 2015 meeting of the New York City Storm User Meetup, Sean T. Allen, principal architect for TheLadders, presented some “small data” uses for Apache Storm, most taken from his book. Sean T Allen @SeanTAllen is the Principal Architect for TheLadders. He started at TheLadders in December of 2010 and has engaged in one brutal refactoring after another ever since. His turn-ons include programming languages, distributed computing, Hiwatt amplifiers and Fender Telecasters. His turn-offs include mayonnaise, stirring yogurt and sloppy code. He is one of the authors of Storm Applied; he wanted to call it “I wanna go fast” but, you know, publishers- ¯\_(ツ)_/¯.